Microsoft just announced a whole lot of stuff at an event in New York, but it saved the weirdest for last. The company, best known for its software and nice computers, is now making headphones. 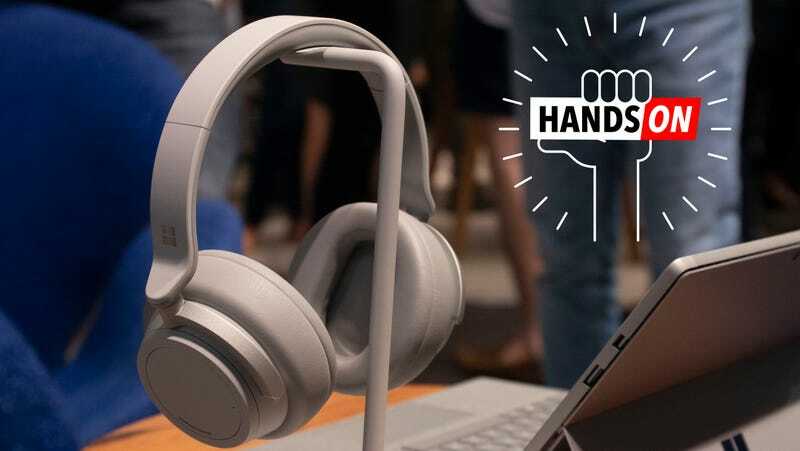 The Microsoft Surface Headphones come in a grey color similar to the platinum found in its computers. It makes them look a little cheap—like the kind of headphones you might find bundled with a more expensive product. But unlike bundled headphones, these also do noise cancelling—though whether that noise cancellation is as good as what Sony or Bose offer remains to be seen. They cost the same $350, so they better offer something cool. The neatest features of the Surface Headphones are the ring dials surrounding each earcup. One side allows you to adjust volume and the other allows you to adjust the level of noise cancellation. At a glance, this is pretty cool. On-headphone controls are frequently really fussy and the simple turning of an earcup ring seems about as artfully intuitive as it’s gonna get. In particular, adjusting noise cancellation in this way is clever. Other headphones have incorporated adjustable noise cancellation, but it’s usually either an on/off control on the headphone or some kind of adjustable setting in an app. The dials turn smoothly, the world filtering back in via the microphones that help the Surface Headphones cancel noise so well. And they do! The noisy showroom disappeared pretty quickly when I cranked the noise canceling up—though I did detect a faint hiss common in active noise canceling headphones. Not enough to be offensive though—especially when I turned the music on with a tap of the earcup. I’ve found the tap pause or play feature on the Sony MX-1000XM3 to be hit or miss, but on the Microsoft headphones were nice and responsive—though I did have to tap a few times to get the headphones to skip tracks. And of course, the Surface Headphones also have Cortana built inside. It’s a silly feature—but so is the ability to tap into Google Assistant on the Sony headphones. Still, if you’ve wanted to check on your calendar or find call someone in your contacts list it might save you a little time or fumbling with your phone while dashing down the avenue. The headphones, which retail for $350, will be available sometime later this year.